Creating directional map with free templates and examples. Directional map has never been easier. Directional map and Directional map 3D are commonly used to show clearly identifiable roadways, metro lines, and landmarks, to create easy-to-read maps and route directions. With Edraw software, drawing directional map can be as simple or creative as you like. You can use symbols, pictures or whatever you like in the Edraw software to make an impressive directional map. One thing you should pay attention to is that make sure you have a compass at the top of the page so the person will know which direction he or she is traveling. Edraw offers the easiest way to create directional maps. 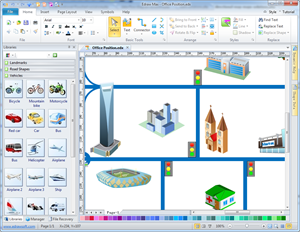 In its exhaustive symbol library, you can find plenty of transportation and maps transit shapes, such as highways, parkways, intersections, road and street signs, routes, railroad tracks, transit terminals, rivers, and buildings, allowing you drag and drop the shapes into your drawing directly without any professional mapping skills, and create a directional map in just minutes. 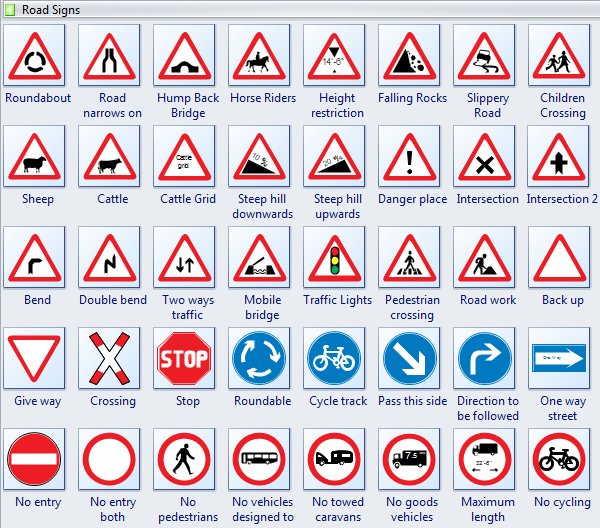 Edraw maps software offers you plenty of road signs, danger place, intersection, bend, double bend, two ways traffic, mobile bridge, light signal, pedestrian crossing, road work, back up, give way, crossing, one way street, etc.